Back in January, I described my 2016 Reading Challenge and said my aim was to read at least 50 books this year. Telling people about this challenge has resulted in responses ranging from wide-eyed astonishment and ‘gosh that’s a lot of books’ to a dismissive ‘50 books? That’s nothing. You can manage at least a hundred. A novel only takes me a day to read. Three days if it’s Russian.’ Personally, I figured a book a week was a decent, very achievable rate, considering I read fast and have plenty of free time, but didn’t want to burden myself with so much reading it started to feel like a chore. Nor did I want to put myself off tackling longer or more difficult books. How’s it going? Well, we’re now 15 weeks into the year, and I’ve just polished off my 30th book (The Hundred-Year-Old Man Who Climbed out of the Window and Disappeared). 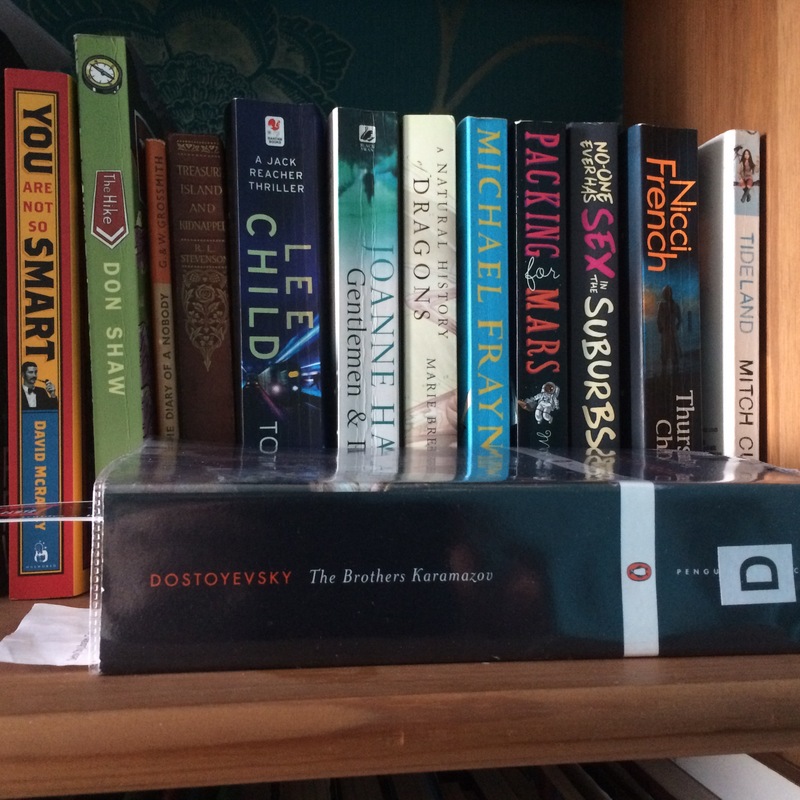 So, yeah, seems like two books a week is no problem – although I’ve only read one Russian novel thus far (War and Peace). Beyond the satisfaction of seeing the numbers clock up, it’s been great to get properly stuck into reading again, rediscovering the old pleasure of spending hours curled up in an armchair with a hot drink and a good book. Books are great, and I’ve enjoyed nearly all of what I’ve read, from the lightly comedic to the dark and disturbing. And I’ve been connecting with people via literature more – being lent books by friends, and lending out books myself to share the joy. Of course, it hasn’t all been plain sailing and smooth reading. I’ve had to give up on two books (not counted in the 30): Outlander by Diana Gabaldon, which was just boring, and London by Edward Rutherfurd, which was so rapey and gross it left me feeling nauseated. And then there was Half Lost by Sally Green, the book I’d been most looking forward to reading this year and which I devoured in a single gulp on its day of publication. It was a colossal disappointment which left me feeling extremely angry at how the author chose to end it. But hey, I can treat such experiences as a valuable lesson in How Not to Write. A) Try something different. Nothing wrong with having a favourite author slash genre (nearly half the books I’ve read this year have been fantasy) but there are good books in every genre, so put away those preconceptions and see if you can surprise yourself. My experience is that people are very willing to give you recommendations (and frequently lend you the actual books). B) Don’t be afraid to give up on something that just isn’t doing it for you. Life’s too short to spend your time wading your way through hundreds of pages of boredom, when you could be reading something way better. C) I’ve noticed that online advice often suggests reading in short bursts, fitted around your ‘today’s busy modern lifestyle’. Now if that’s the only time you can find to read, fair enough, but I’ve actually found that I enjoy a book more if I can get properly stuck in. An hour or so of dedicated reading time each afternoon, plus the aforementioned armchair and hot drink… that’s the kind of challenge I can really get behind. I should also add that another way I’ve managed to increase my novel consumption is by listening to audiobooks, which means I can be ‘reading’ at the same time as driving, exercising, or doing household chores. It’s a great way to read more if your life is too busy to sit down with a book very often, or if you struggle with the written word because of dyslexia, eyesight issues etc (I myself get sometimes get migraines or eye strain and have to be careful). And certain books – most notably so far Neil Gaiman’s Anansi Boys as read by Lenny Henry – are actually much better in audio form.